In our last lesson, in our look at learning Media 100, we talked about how to get additional elements into Media 100, so you always have the exact elements you need at your disposal. In this lesson, I want to start talking about adding text to your composites, as it’s a common task that you’ll always want to know how to do! The first thing that you’ll need to decide is “What type of text do you want to add to your composition”. You can choose between flat 2D and Extruded 3D. In this lesson, we’ll talk about 2D Text. To add it, simply hit the “Add Vector Text” button at the top right corner of the timeline’s command button window. Once the text is added, the Text input window will open, and you can type in whatever text you need. 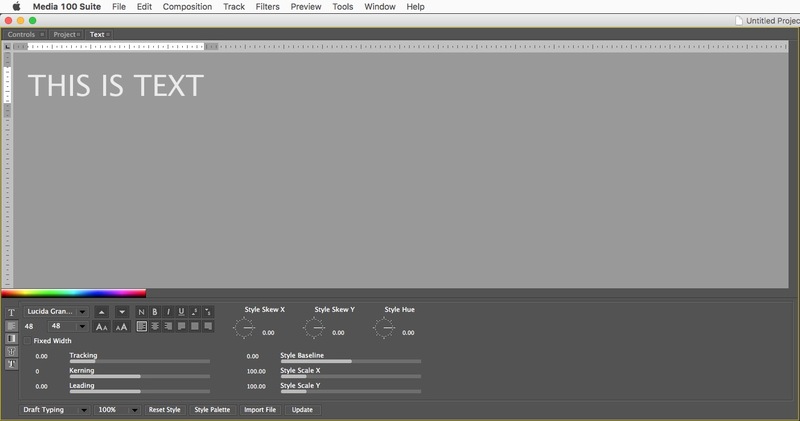 If you’re familiar with any other Boris FX product, this title tool is exactly the same across their entire product line. Once your text is entered, you can select it in your timeline, and you’ll now notice that the Controls tab is slightly different than it was before. Boris Red will reconfigure the Controls window to give you the tools you will need, based on the element you have selected, which is very clever, and a great workflow enhancement. Click here to learn more about Media 100 [affiliate link], where you can download Media 100 absolutely free! Check back soon for more Media 100 tutorials!